Placed as the 40th ShukubaW (post station) of the Koshu-kaido (one of the Five Routes of Edo periodW that leads from Nihonbashi, Tokyo to Shimosuwa, Nagano), Daigahara remains as it has been in the past with the traces of old Japan. The buildings along the road are still mostly those of 100 to 200 years ago. In the old days, this place prospered with people traveling up and down Edo to Shinshu (Nagano) as well as the Sankin-kotaiW Samurais. 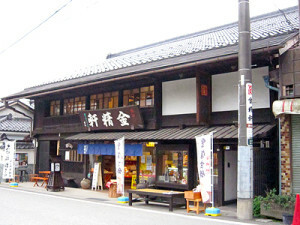 There used to be inns, restaurants and shops offering their services to travelers and among those was the ancestor of Kinseiken, started to sell their sweets in 1904, late Meiji Period in a building that used to be an inn built in 1852, called ‘Maruya’. 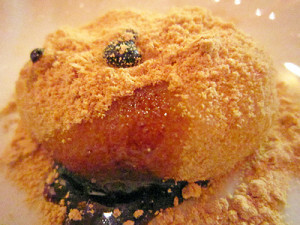 One of the famous sweets of Yamanashi prefecture is ‘Shingen Mochi’, a sweet named after Shingen TakedaW, a famous feudal warlord of provincial war in Japan (1467 ~ 1615), still popular now in computer games. It was said to be named so because intelligent Shingen was said to have brought enough provisions all the time to battle fields so that his troops could overwhelm the enemy’s starvation tactics at any time. One of the provisions was ‘MochiW’ (sticky rice cake) which was preservative food and also an energy food at that time for warriors. There is no record of the past saying that Shingen fed himself or his troops with Mochi with ‘KinakoW’ (soy bean powder) and ‘KuromitsuW’ (dark molasses syrup) as ‘Shingen Mochi’ is now. 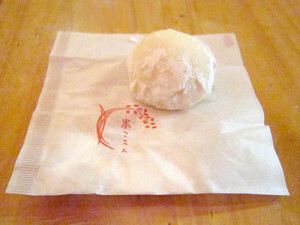 The ‘Shingen Mochi’ became its style through the tradition of Yamanashi prefecture, a tradition of making and eating ‘Abekawa Mochi’, a cooked Mochi covered with sweetened Kinako, without Kuromitsu, ate on festivities. Kinseiken is one of the two famous ‘Shingen Mochi’ confectioners in Japan that made ‘Shingen Mochi’ famous throughout Japan. You can find their products in hotels, souvenir shops and service areas on highways but it is a worthwhile to visit their main shop to see their building as well as tasting the fresh ‘Shingen Mochi’ with very short shelf life at the old Shukuba of Daigahara. They also sell domestic Japanese sweets of the season as well as regular products which are worth a try eating or just seeing at their display. 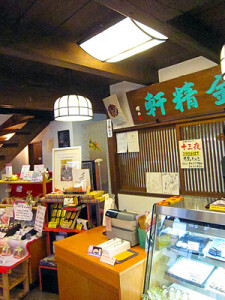 When we went there to get our fresh Shingen Mochi, it was a surprise to have found out that present ‘Ennosue Ichikawa IV’, a famous Kabuki actor, ordered his little original confectionery gift in a special wooden carved box at this shop, Kinseiro, and it was displayed and sold there! Ennnosuke Ichikawa IV, named ‘Kamejiro Ichikawa’ when he played a role of Shingen Takeda in the NHK Taiga DramaW (Japan Broadcasting Corporation’s Big River Drama, an annual, year-long historical fiction drama) “Furinkazan” in 2007 while GacktW, a famous Japanese Rock star played ‘Kenshin UesugiW’, the fateful enemy, could be the reason why he selected ‘Shingen Mochi’ as his gift. This special confectionery gift box is around 5,000 Yen but if you are looking for a special gift, this could be it. 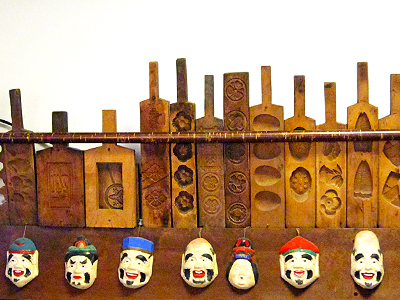 The shop opens its upstairs floor as a gallery introducing local artists to the public where you can enjoy both the old style of the Japanese inn and new arts of the present. Address : 2211 Daigahara, Hakushu-cho, Hokuto-shi, YAMANASHI Pref.